You’ve made a great choice for improving your smile, and we’re happy to welcome you to our office. We’re proud to deliver modern dentistry to the communities of East Rockaway, Oceanside, and Long Beach. 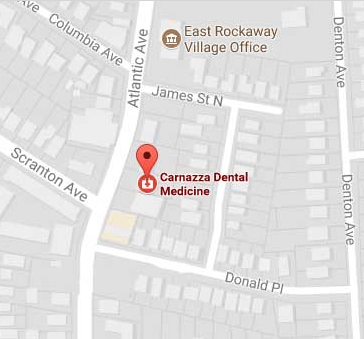 Dr. Carnazza is a hometown gentleman with the philosophy that developing patient relationships and earning respect and trust is the most valuable part of dentistry. From the moment you first contact our office, our relationship begins. When you come for your first visit, you can expect to spend some time talking with Dr. Carnazza about your goals and desires for your smile. We’ll take x-rays and with your permission, Dr. Carnazza will have a look inside your mouth to assess your current oral health. Together, you will create a treatment plan that suits your needs. The entire process revolves around your level of comfort, and some patients prefer to have the initial consultation split into separate visits. Dr. Carnazza is laid-back yet professional, and will respond to your needs in a way that works for you. It’s all about keeping you relaxed and comfortable, no matter what the reason for your visit. Whether you’re having an advanced procedure, or just receiving a cleaning, your comfort is a top priority. Listen to Pandora radio, take in the scents of our aromatherapy candles, get lost in a magazine, or let your imagination run wild as you consider your ultimate smile while reviewing our before and after photos on the screens in our treatment rooms. We believe in showing you the smile you deserve, which is why we outfit our office with images of beautiful, sparkling smiles. We create a calm, gentle atmosphere for the ultimate dental care. Financial situations should not determine your oral health. We understand that many of our patients have a budget, and we respect that. We’ll help you get the treatment you need while staying within your financial needs. We participate with PPO’s, and grant a 10% senior discount. For big cases, we require a 50% deposit up front, however we can also offer a 20% discount on major dental work. Third-party financing through CareCredit is also available, and offers patient another option for payment. Don’t forget, we’re happy to give a $50 credit to patients for referrals.